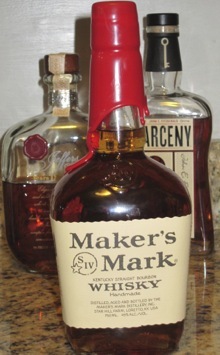 Maker’s Mark 46 – Instead of going into to the bottling line, some Maker’s Mark is diverted to a second period of aging with a barrel using seared French oak staves. The result is a more complex, more complete bourbon. It’s $10-15 more per bottle, but well worth it in my opinion. Old Fitzgerald – Whiskey writer Chuck Cowdery says he’s heard stories that Pappy Van Winkle gave Maker’s Mark creator Bill Samuels Sr. his Old Fitzgerald recipe for what would become Maker’s: “Put it in a fancy bottle and charge an arm and a leg for it.” Today Old Fitzgerald is made at Heaven Hill Distillery. The regular 80-proof gold label is slightly less refined than Maker’s but also half the price ($13). Larceny – This newcomer, also from Heaven Hill, impressed me when I tried it. Just as sweet as Maker’s but richer in character, it’s more my style. And at $25 a bottle it’s the same price as Maker’s. Old Weller Antique 107 – Weller is the “wheated” recipe from Buffalo Trace Distillery. At 107-proof, this is a bit hot straight. A splash of water opens it up nicely with banana, vanilla, and caramel notes. Also around $25 a bottle, it’s a great substitute for Maker’s Mark. Jefferson’s Presidential Select 18 – This special 18-year-old bourbon is a pricy, limited bottling of some of the last remaining bourbon distilled at the Stitzel-Weller distillery, which closed in 1992 (meaning it’s the pretty much the same stuff that goes into the super-elusive Pappy Van Winkle 23). While $80-100 per bottle makes it a big step up in price, if you want to see what extra long aging can do to a “wheated” bourbon, this is the tasty result. Maker's Mark is the Macanudo of bourbons… well-made, dependable, and the first step for many people as they explore all that bourbon has to offer. But once you start trying other higher-end bourbons you realize it's a little mild and a little bland, while others are more interesting and more complex. Makers 46 and Larceny are good recommendations. Also Blantons, Woodford Resreve, Evan Williams Single Barrel and Angel's Envy should be on the list. I think the Macanudo comparison is pretty on point for the reasons you gave. As for the recommendations, Blantons, Woodford, Evan Williams and Angel's Envy are all great. (I have three of the four on my shelf right now.) But the reason I chose what I did is because they are all "wheated" bourbons (that is they use wheat instead of rye in the recipe, with corn remaining the primary ingredient).